That fabric print would look perfect on my doll! 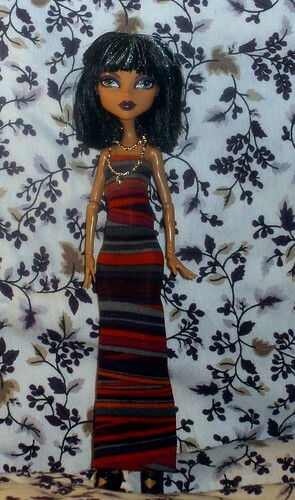 Re: That fabric print would look perfect on my doll! Oh, all the time! AND, I'm always looking at clothing and trims, thinking 'oh, that'd make a cute dollie skirt/top/vest/whatever'!! 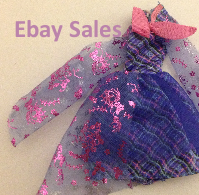 I recently got a piece of baby clothing on clearance (so under 2 bucks) JUST for the cute fabric for dollie clothing. One specific piece of yardage I got was some cool Lycra stretchy knit, has an overall small texture-looking coloring with pink as the primary color. I got it for my 17" Gooliope, and liked the pattern SO much that I also got some in the black/white/grey colorway. Just in case the pink was TOO MUCH pink, ya know?! Not sure yet what I'll make, but I got enough fabric so I have options. Good question! 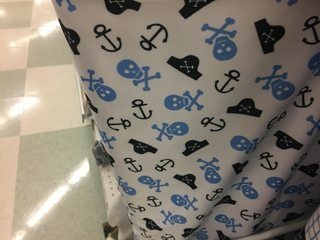 And love the pirate-ish fabric...did you get some? No, didn't get any. I don't have sewing experience so I'd want to get a little bit of practice in with easy patterns and cheaper scraps before tackling an actual project. I've heard its good to sew yourself a pair of pajama pants first to get a feel for sewing and especially before moving on to small clothes. Unfortunately, I'm not quite ready for it. I always thought Iron Fist's prints were perfect for MH dolls due to their skull-theme. Unfortunately they were so expensive that I couldn't justify buying any just to make them into doll clothes. Also, I just have to mention Irregular Choice shoes. They made wonderful quirky shoes with different themes. The pj as your first sewing project is a good idea. At some point you just have too take the plunge and try. Do you know anyone that sews? They might be able to help. And you tube has some great tutorials. I am no expert and frequently have to redo or try another tactic. Often the staff at the fabric store can help you, if you explain what you want to sew. They can say if the fabric would be good for certain projects. And even if a print isn't teeny-tiny, it can still work! I bought some clothes from an etsy seller in a skulls & roses fabric, I wouldn't consider it 'doll scale' but it works for me, I love it. And when I recently saw the same fabric at JoAnn's, I bought a yard so I could make MORE stuff. Think how clothing designers play with scale and pattern all the time. Have fun! If dollie or human jammies are too much, you can always make pillows and blankets for your Ghouls, or even capes/scarves! Straight lines! 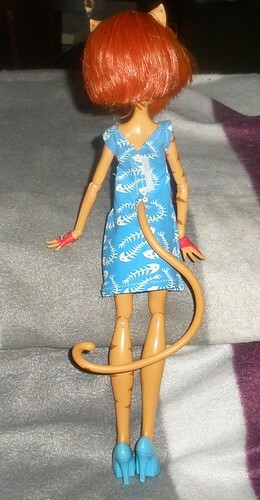 I love to find people clothes that can be turned into cute outfits for dolls. A few years ago, I found a top for 25 cents in a thrift store whose print looked perfect for an outfit for Cleo. 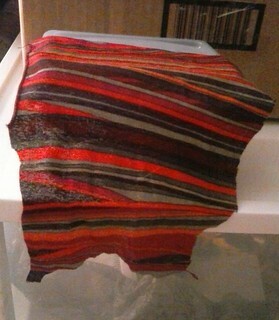 Here's a scrap of fabric I cut from it. After trying to decide what to make with it, I came up with this. Other times, if I see a fabric print I like, but is too large, I will attempt to scan it (not an easy job! ), resize, and then print on printable fabric. My only gripes are the scanning process is difficult and I wish I could find a lighter weight of printable fabric. But still, if I really want it, I'll do it. I'm always thinking of fabric or making human clothes in doll versions. I really admired a lot of Japanese fabrics. The prints are so cutesy!! And I think it's easier to find small prints. Another good source for small prints is used kids/baby clothes. I have such a huge stash of fabric though, I try to not buy anything new. If you get a quarter yard of cloth, you can make a ton of doll clothes out of it (and 0 people clothes) so don't think you have to practice with big clothes first! You screw up on doll clothes, eh, waste a few scraps, still have lots left for a redo. It's much faster to hand-stitch doll clothes than people clothes too, so you don't need a machine. Just have to remember that the qualities of the cloth dictate what you can do with it. You can't wear a T-shirt made out of satin. Doesn't work. Stretchy knit stuff makes great body-hugging cocktail dresses, t-shirts, hoodies, raglans, and PJs. non-stretchy stuff like satins and taffeta make good dresses, skirts, and blouses. Awesome Cleo dress! Is that a knit? Did you use any fasteners or just a slide-on tube? What type of printable fabric are you using, and where'd you get it? I, also, have a large-ish fabric stash, some is yardage, some thrifted clothing. 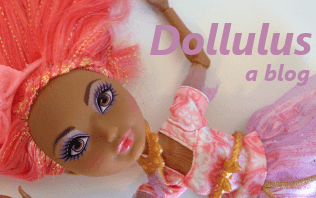 Just waiting for me to turn it into dollie stuff. Thanx Lisa! It's a stretchy knit fabric. I just basically sewed it as a slide-on tube dress, but did not sew it up "straight", since I thought it'd look prettier if it had some "give" towards the bottom. ATM I have used colorfast printable fabric sheets I got at Jo-Ann. I chose colorfast because the colors wouldn't be as likely to run and bleed, altho I learned the hard way not to apply fabric softener to it. It will distort the color and make it look gray-ish. Here's a dress I sewed up for Toralei using printable fabric, and a cute print I found online. This was before I applied fabric softener to it. The fabric is neither soft nor stretchy. I attempted to leave room for her tail. If you or anyone else knows if they make lightweight colorfast printable fabric sheets please let me know! Only people I know who sew are too far away to help, so I've been relying on youtube. They make it look easy so I'm hopeful I won't struggle too much! How cute is that dress? It's like colorful wraps, I love it! The Toralei dress is really cute too, but that's a shame that it isn't a soft fabric. Keep us updated if you find a lightweight printable fabric! Draculaura? Spectra? Two for Skelita. And that's just dresses! 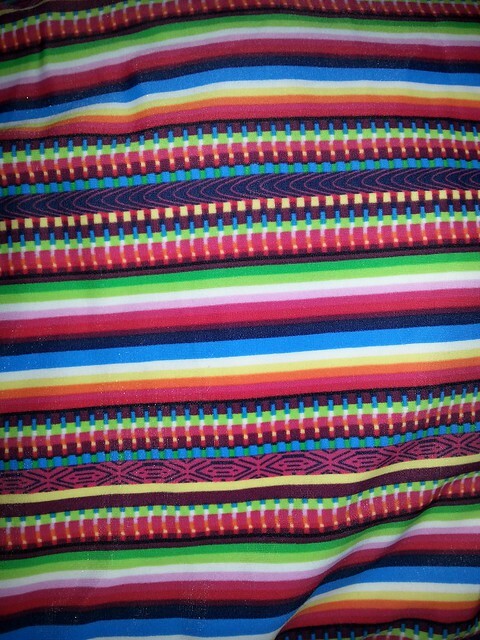 This thread has inspired me to think about fabric choices in a slightly different way, maybe, or at least has my eye 'looking' for fabrics suitable for 'characters' - so when I was at the thrift store on Sunday, and spied this (unworn with tags!) swimsuit top, I thought 'Frankie!' because of the 'stitches' in the fabric design, and the bright, clear colors. So I got it! (and paid more than Wuvmykitties's 25 cents bargain!) There's a lot of fabric, as it's the kind of 'skirted bodice' top that covers one's whole top and midriff, PLUS there are tie straps! Leggings! So thanks, Simply for starting the thread, and Wuvmykitties for posting your inspirational Cleo dress and fabric pics! Really pretty! I think of Jinafire a little when I see it, what a versatile choice! I grabbed a few fat quarters at Walmart today, they have a pretty good selection of really small prints! 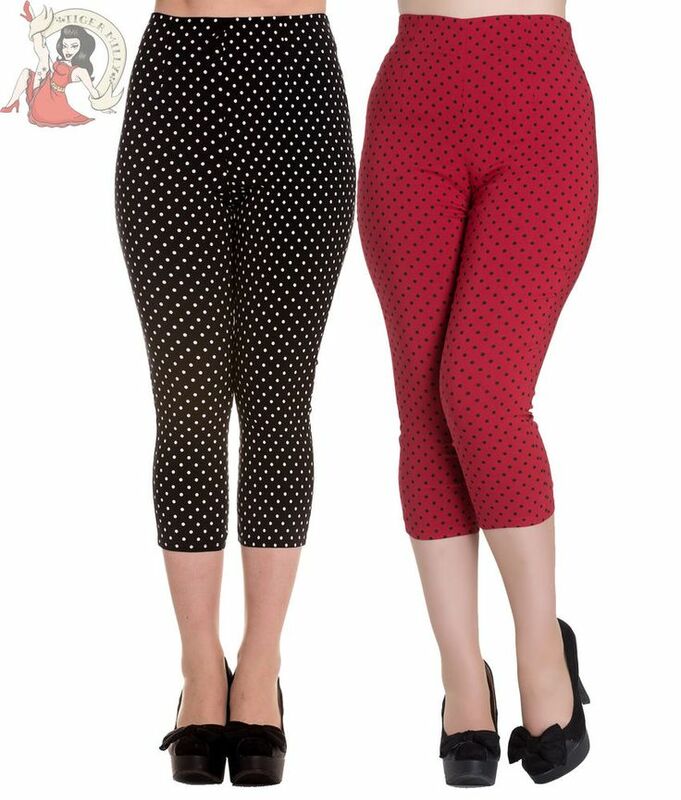 I grabbed a red with black dots fabric that reminded me of Operetta, mostly because I own these pants and they go well with her rockabilly style! Haha! At a completely different Goodwill, several weeks later, I found another swimsuit top in a fabric that was the same type/pattern but mainly green! HAD to get it to experiment with mix/match. Too funny. I see fabric that makes me think of dolls all the time! I don't usually redress my dolls, (I know, I'm boring ) but I make doll beds, so I'm always on the hunt for the perfect fabrics! respositob, I bought a big scarf at Goodwill yesterday to use for a Lagoona bed/room eventually...reminded me of seaweed and beachy stuff. Also bought a woven straw makeup bag to use for her headboard! Yay! I think it's so much fun making doll beds! I hope you'll enjoy it too.